Check out the Racine Journal-Times article! Who do you want more time to talk with? To KNOW Him is to LOVE Him. Grow your relationship with Jesus today. What mom wouldn't love more time talking with their son or daughter? Don't wait. Give your mom your TIME to listen and speak with her now. The foundation of every marriage is Jesus and communication. 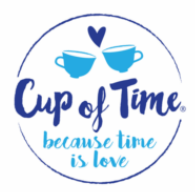 Show your love for your spouse with Cup Of Time. One of the best ways to show our love for someone is by spending time talking with them. Life is busy. Our world rolls faster and faster continually. No matter what our social status is TIME disappears. Most families are turning to electronic forms of communication. Our Team believes there is a place for social media and such but it was never intended to REPLACE our natural form of communication. Cup Of Time keeps us in tune with our relationships. Those that we hold dear need our undivided attention on a regular basis. We at Cup Of Time are passionate about families: Husbands and wives enjoying all that they are. Daughters aspiring to be the best they can be and dads knowing what that is. Moms eager to cultivate the best her son will become. How does this happen? Through verbal communication: talking and listening! Cup Of Time is a movement to remind us all that verbal communication is our natural voice. Just as everything in nature is essential for its purpose, TIME listening and talking with the voice God gave us is crucial for happy, healthy relationships.